About Delta Industrial | DELTA INDUSTRIAL SERVICES, INC.
Delta Industrial Services has been dedicated to providing professional building maintenance and painting services to clients in northern Ohio since 1944. Our longevity and growth are the result of the consistently high quality of services we provide to a growing list of customers. We never lose sight of the fact that what we offer our customers is Service. We strive to maintain unmatched levels of service by constantly training our team members, giving them the skills to assure safe, efficient, and consistent cleaning processes. Doing so will help us achieve our goal of being your first choice for industrial cleaning and maintenance services. We have over five decades of experience, dependability, and reliability. We will schedule our services to meet your needs and cause minimum inconvenience to your operation. Whether it is at night, on weekends, or during vacation periods, we can accommodate your schedule. We also have crews available around the clock to respond immediately to emergency situations of any size. 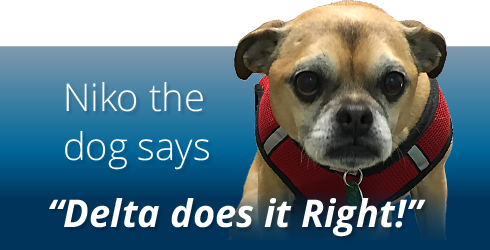 Delta is a service company – the only thing we have to sell is service.